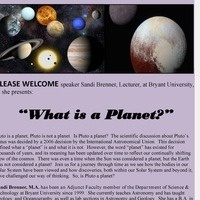 The Department of Science & Technology Seminar Series is pleased to welcome speaker Sandi Brenner, Lecturer, at Bryant University as she presents: "What is a Planet". Pluto is a planet, Pluto is not a planet. Is Pluto a planet? This scientific discussion about Pluto's status was decided by a 2006 decision by the International Astronomical Union. This decision defined what a "planet" is and what it is not. Join us for a journey through time as we see how the bodies in our Solar System have been viewed and how discoveries, both within our Solar System and beyond it, have challenged our way of thinking. So, is Pluto a planet?